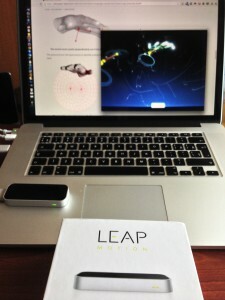 Last week we received the Leap motion device. For those who don’t know what is Leap Motion, it is an advance motion sensing device, similar to the Kinect but unlike the Kinect it is targeted to be placed on a physical desk in front of a user. Tools like Leap Motion are important for the future as with the introduction of Kinect but more importantly of touch based smart phones and tablets the traditional keyboard / mouse based interaction with a computer tends to fade away being replaced by touch and gestures. After playing a bit with it I can say that is an interesting tool, and as anything in life it has it’s sweet spots and rough edges. Requires new models in handling interaction information. We are not speaking about clear declared intentions as a mouse click is. A circle gesture will also involve probably a small swipe gesture so filtering out the exact intentions from the data will be a bit tricky. 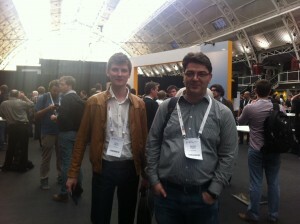 Excellent day in London at the AWS Summit 2013. Amazed at how mature and comprehensive Amazon cloud offering is and how big and small companies as well as big names and unknown startups use the Amazon cloud and the architectures so easily supported by the Amazon offering and transforms those into competitive advantages. Really amazed at the scale Amazon operates and the rock solid and secure technologies and practices they employ, really no conventional company data center can come even close to the way Amazon operates their clouds, neither in terms of scale, computing power, efficiency as in procedures and security. Really looking forward to find ways to transform the things I have seen today into competitive advantages four our customers.